I love Kraus products. This is my 3rd kitchen faucet. I used one in a condo remodel, another in a house when I moved, and will be using this for my remodeled kitchen. All Kraus faucets have a great look and value. It's like having a piece of jewelry for your sink! Transform your kitchen with the sweeping lines and soft curves of the eye-catching Nolen faucet. The contemporary design of this pull-down faucet features a dual-function sprayhead with rocker switch, allowing you to easily switch between aerated stream and powerful rinsing spray. A flexible nylon hose with swivel adaptor offers unparalleled range of motion and effortless movement all around the sink. Soft rubber nozzles make the sprayface easy to clean and maintain a lasting powerful flow. An optional deck plate (included with purchase) allows you to install this single handle faucet with a 1, 2, or 3-hole sink. Dimensions 11.5 In. X 3.9 In. X 16.4 In. I had a licensed plumber install this kitchen faucet. It had very poor water flow. He removed the restrictors and the aerator. It still had poor flow. We used the manual to troubleshoot and followed the directions in the manual and still no improvement. The plumber called Kraus Customer Service. The tech department was less than helpful. We tested the flow rate which minimum states it should be 1.8 gallons per minute. We tested it without any restrictor or aerator and it was 1.1 gallon per minute. The faucet looks beautiful, but if it doesn't function properly, what good does it do. I am now returning it to Overstock for note functioning as described by the manufacturer. I am out $ for paying a plumbing to try and troubleshoot and install and then uninstall a faucet that does not work properly. I am VERY disappointed as I loved the look of this product. This faucet is really well made. It had the bst rating when I reviewed before purchase and I think the reviewers were correct. Very nice finish and so easy to turn on water. Pressure was great on both faucet spray patterns. The water lines are included with this faucet and they have screens in both. Some people complained about faucet pressure and I think these screen could have been clogged due to hard water...just a thought. I will watch for this since I have hard city water. This faucet was so simple to install screw bottom nut on snug and snug two screws against nut and faucet is locked in. I bet I had it installed in ten minutes. You won't be disappointed with this faucet. This is tough. I like the faucet. I have a zero radius dbl sink and white shaker cabinets - so very simple, clean, squared look, which this fits the bill. I had to have the granite reground bc this faucet sits much further back than a typical Moen. Know that if you're doing a reno - check to be sure you have enough room behind the faucet for it to fit squarely on your counter. The water pressure is not so great until you put spray on and then its like a fire hose! I wish they would improve the aerator. Bc its longer, it reaches across my dbl sink with ease. Finish is nice. Personal preference - had contractor switch the hot and cold lines bc it seemed unnatural to me for cold up and hot down - strictly personal pref but know it is quite easy to switch the lines if you wish and installation was fairly easy as well. My weight gets jammed up more often then not - limiting the weighted return of the pull down head. Not a big Deal. Now for the items not the faucets fault - the first faucet I received was misaligned. The welding or structure wouldnt allow the head to ever sit normally in alignment with the body. Kraus customer service was fairly slow in responding and it took a cpl calls. So the next one finally comes and its dented. This time I call Overstock right away, who offers a minimal compensation or I can wait a few weeks AGAIN for another faucet. I cant wait any longer so I opted to keep my brand new, dented faucet. I still haven't received the credit offered from Overstock, nor instructions from Kraus about the original. I expected more from Kraus, I really did. I was disappointed to receive two faulty items and the lack of communication or direction from them. So 3 stars - faucet itself is probably a 4 - not a 5 due to low water pressure in normal mode and the fact that the body is angled so far back it may limit who can use it in their existing kitchen set up. It looks darn purdy and is different. Different is more unique and gives the kitchen class. The customer service/getting sent 2 subpar faucets was a 2 star experience. Love the design and the quality of the product. One negative aspect is that the cross-section of the neck where the faucet swivels, is not round but is flat in the back. This means that when off-centered the parts of the neck don’t line up. So modern and sleek. Goes perfect with my Kraus sink! Nice and heavy. Very happy with purchase. Super easy to install. Love the contemporary design. It was packaged VERY well. I definitely was not disappointed when I received this Kraus Nolen kitchen faucet. It is quite beautiful and looks high end. It hasn’t been installed yet because I’m waiting for my new countertops but I have no doubt that it’s going to look fabulous in my new remodeled kitchen. Amazing faucet. Easy set up. Looks amazing against our black granite sink. My new faucet has been installed for one week and I love it! Beautiful and easy to install. Highly recommended. just as expected, works well, simple and the spray nozzle has a great strength! Ordered a Kraus kitchen sink that looks amazing so hoping the faucet will match. This new look is. Rey cool and will accent my new kitchen design beautifully. "Hi. 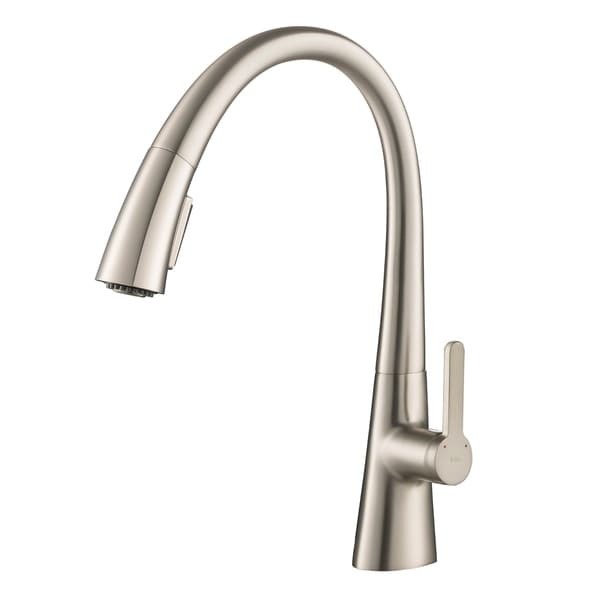 I'm looking for a Kraus touchless kitchen faucet. Do you have it??"